Greetings to my fellow Arsenalistas from bright and sunny Manhattan this morning. There's a bit to talk about ahead of our away match at the crumbling ruin that is Stamford Bridge, and as it's not as though there's a dialogue here... it's pretty much me talking to you all... Suffice it to say that I'm glad you're here and glad you took the time to learn to read. Anyway, I won't waste time with further pleasantries, so let's get into it. We start with the Carling Cup match at home to Bolton on Tuesday, where a heavily rotated Arsenal side took the pitch against what was by and large Bolton's best XI (the Carling Cup being their best opportunity in any competition). 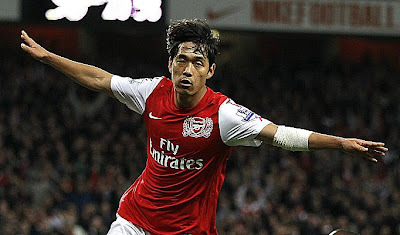 Arsenal started Park Chu Young (still not certain how his name is spelled or even the order of the words) at forward for only the second match since his arrival at the club 2 months ago, and Andrey Arshavin played in the number 10 role, where he seemed rather more at home. Additionally, Squillaci made his debut this season (the crowd roared with indifference), The O-C got another start as did the midfield duo of Frimpong and Coquelin, the debut of Nico Yennaris at right fullback, and there were other changes from the weekend as well. Most significantly, we saw the return of Thomas Vermaelen from his long injury absence. I won't speak much on the first half, as I missed the majority of it; I nipped out of work a bit early to catch the 5pm replay of the match at The Blind Pig and didn't get down there until about the 35th minute. What I did notice was Arsenal controlling most of the ball up until halftime. As the match was being replayed on Arsenal Player, there was about 30 seconds of halftime, and 2 minutes after the restart former Arsenal reserve Fabrice Muamba fired the visitors into the lead after his interception led to some good interplay with Darren Pratley on the edge of the Arsenal box. It wasn't long before Arsenal responded. An moment of inspiration from Arshavin saw the Russian dance into the right side of the Bolton area. Three Bolton defenders all held back in fear of Andrey skipping past them, but they also created just enough space for a shot, and our comrade did not disappoint, striking a worm-burner inside the far post to equalize. Just two minutes later, Arshavin again was driving forward from the center circle, three defenders again focusing on him as Park had wandered offside. Arshavin held the ball and kept moving forward, allowing Park to drop back onside and sidle off to the left, where a brilliant ball from the Russian put Park free into the left side of the Bolton box. Park hit a one-time curler past Jaaskelainen inside the far post. It was a sumptuous finish from Park, and, as many have already said, reminiscent of Thierry Henry... High praise for the Korea captain, a great way to open his Arsenal account, and certain to make the voices calling for him to see more action in the league to grow that much louder. There were no other goals in this one, though there were chances for both sides. Fabianski got a rare start in goal for Arsenal, and produced a few fine saves, yet also nearly knocked a pretty simple shot into his own net. All in all a pretty typical Fabianski performance. By and large I felt the makeshift back line acquitted themselves well. Ignasi Miquel was impressive again, this time at right fullback, Squillaci was steady, the debutant Yennaris didn't make many glaring errors, and Thomas Vermalen showed no ill-effects from his injury. He did go off with 5 minutes remaining with a pull in his calf, but it seems this was more precautionary than anything, and he seems fit for Saturday at Chelsea. Ah, the Chelsea match... what to say? Despite our positive run of form the past few weeks and in spite of Chelsea's loss to QPR at Loftus Road on the weekend, Arsenal go into this match the clear underdog. Chelsea will be without Didier Drogba, who picked up a red card at QPR; given his proclivity for scoring against Arsenal, that's certainly one in our favor. But it's not as though Chelsea are a one-man team. They have a very deep squad, and even without Drogba will still boast Anelka, Daniel Sturridge, and Romelu Lukaku as forwards. They also will likely start Juan Mata, who so nearly was an Arsenal player this summer, but didn't end up signing for us because Chelsea caught wind of our interest and stepped in at the last minute, telling him how much higher his salary would be at CFC. Not the first time we've been gazzumped by clubs with deeper pockets, and won't be the last. But it still stings seeing that player succeed at the club that stole him from under our noses. With Vermaelen back and healthy, it makes sense to slide Koscielny out to fullback in place of the slower Djourou, who I picture having a very hard time marking Mata. Otherwise the Arsenal starting XI pretty much picks itself. It will be interesting to see who makes the bench, however. Arshavin is a certainty of course, but I would also be surprised if Park was excluded. Chamakh will probably find himself there as well, although Chamberlain's lackluster performance, coupled with Wenger's aversion to exposing the youngster to too much too soon, dictates he'll be left out, likewise Ryo who made only a brief substitute appearance on Tuesday. Djourou will be included one way or another (if he's not starting, he's on the bench), Frimpong and Coquelin, and likely Squillaci as well. If I'm not mistaken, Benayoun's loan terms prohibit him from playing against Chelsea, so he'll sit this one out. That being the case, we're slightly bereft of attacking options, so we'll have to hope Arsenal don't fall behind, especially early on. But as with all things Arsenal, anything can and usually does happen. Be prepared. Finally, the AGM occurred yesterday. Press in England jumped all over the discontent shown by some of the attending shareholders, and I've seen video of two who were disappointed in the way Peter Hill-Wood handled himself and regarded his audience, but being upset with PH-Dubs for being a bit prickish is like being upset at a tiger for eating your friend. We should know what to expect by now. Stan Kroenke's opening remarks as shown on Arsenal Player were so banal and unrevealing that he must've been told to just go up and talk 2 minutes before without any topics in mind. Arsene Wenger also spoke regarding the need for all of us to be united behind the team if we are to succeed, while recognizing that he himself is not above questioning. Fair play to him on that, and there's nothing I can disagree with in his time on the mic. Arseblog has more on the AGM in today's Arsecast, featuring the prolific Tim Stillman. That's all for now, dear readers. Get your rest tonight; it's going to be an eventful day tomorrow. COME ON YOU REDS.